Home Ben Oruma Ph. D Wheres God When We Need Him? Wheres God When We Need Him? 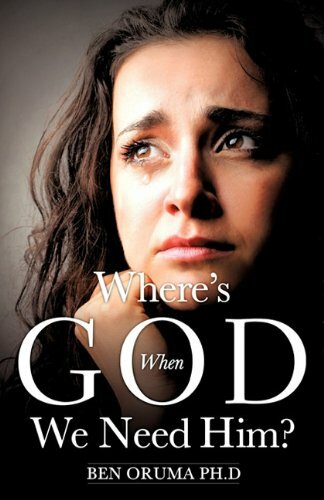 Title: Wheres God When We Need Him? Where's God When We Need Him? While God is our help in the time of need, finding Him can be frustrating. How does one locate God in the midst of a storm? Why does God seem so far away when we need Him most? Using Sarah's long wait for Isaac and Job's long-suffering with many Biblical as well as numerous real life experiences, the author reveals where real answers to life's issues may be found! Ben Oruma, Ph.D. Bishop Ben Oruma is General Overseer of the City Breakthrough Chapels. He is a church-planter and conference speaker. His pulpit ministry reaches millions of viewers every week through his Breakthrough Chapel telecasts on Face-to-Face. Ben Oruma, his wife and co-pastor, Joy and their daughter, Omenesa, operate from the ministry headquarters in Abuja, Nigeria and Lousville, Kentucky.